When I re-started this blog I promised myself I wouldn’t put pressure on blogging or apologise for the length of time between each post, but really, I am sorry it’s been so long since my last post! Life with a 15 month old has been pretty hectic there is barely any time to sit down and do anything, let alone make things to blog about! I really admire mum’s who can juggle both blogging and a toddler I don’t how you do it! Any tips would be greatly appreciated! I hope you all had a lovely Christmas and a happy new year! It seemed to go too quickly and it seems surreal that we are already in 2017. I am clinging on to Christmas by still having my decorations up. I’m going to wait until 12th night (6th Jan) to take them down. I just love the coziness of the Christmas lights. 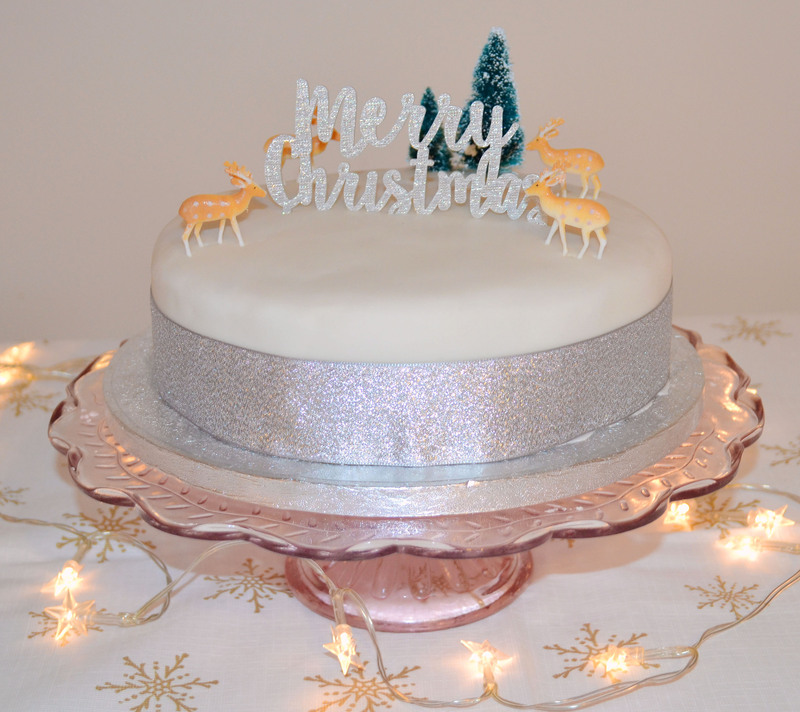 In my last post I shared with you my plans for making a Christmas cake. The weeks leading up to Christmas I fed it with a little brandy, but was still unsure how I wanted to decorate it. I had elaborate plans but had to be more realistic with time being an issue. I didn’t decide until the day I iced it if I was going to use royal icing or fondant. 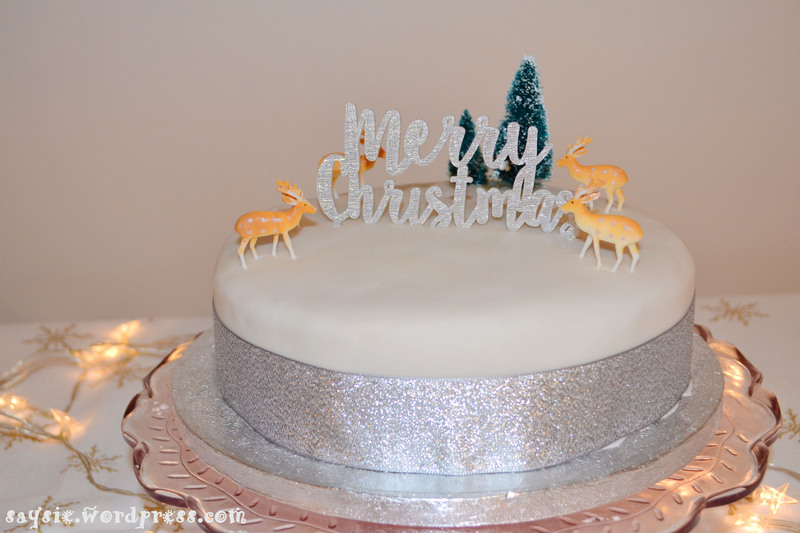 I like the rustic, snowy look of royal icing, I had bought some reindeer and trees and wanted to create a forest scene, but at the last minute I decided to use fondant. I was a little nervous as I know it can be quite unforgiving and show off every little lump and bump. I haven’t iced a cake with fondant since school so I was fairly pleased, I feel it could have been more perfect but I think it passed. Maybe not to Mary Berry’s standards though!? A close up of the topper, it was really hard to pick up the sparkle on the Merry Christmas! It’s by Ginger Ray and can be bought on places like Amazon or EBay. So the cake is probably not what I had in mind, it’s certainly not a grand creation, but for a first year attempt and being a sleep deprived mum of a very clingy 15 month old I am pleased. I will definitely be making another for next Christmas. Unfortunately I couldn’t sample any, I’m on a dairy free diet as my daughter is intolerant and I’m still breastfeeding, but those who did sample it, phoned and asked for more so I must have got something right! So what are your plans for this year? Anything exciting planned? I am hoping to get back in to the kitchen more, and definitely plan to sew more. I have a couple of makes that I did for Christmas that I would like to share with you and I hope to that soon.